If you're looking for a more unusual place for a body piercing that doesn't verge into the extreme, consider wrist piercings. These surface piercings are highly visible, but may not last for long periods of time. 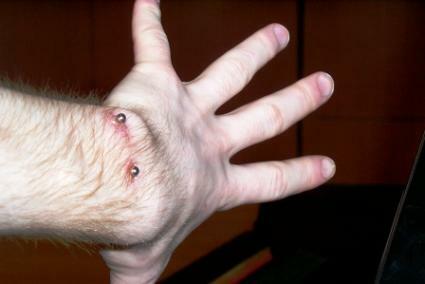 A piercing in the wrist is actually a surface piercing; it does not go through the entire limb. Rather, the skin is gathered and clamped before the needle is pushed through and a barbell inserted. Similar to an eyebrow piercing, the jewelry enters and exits two nearby areas of skin with the jewelry sitting beneath the skin's surface. Wrist piercings are a type of surface body piercing, meaning the bar bell is pushed beneath the surface of the skin, rather than through the body part. Surface piercings have extremely high rates of rejection, and some people feel the location of the wrist puts the piercing at even greater risk due to movement. If you are considering a wrist piercing, make sure to think about the potential problems you will face to help make an informed decision. Surface piercings should ideally be done in two stages. The first stage will involve a much longer barbell to allow the wrist to swell up without putting pressure on the jewelry. Once the swelling has gone down and the piercing has started to heal, a second, smaller barbell replaces the longer barbell. The material of the barbell also matters. Flexible, nylon barbells may be beneficial during healing stages, as are titanium barbells which contain no nickel. Silver and nickel barbells will help speed up the rate of rejection. Sleeves, clothing, bed covers and other fabrics have a higher risk of getting caught on a wrist piercing, which can irritate the healing skin. Occasionally, the barbell can even be torn from the skin if the snag is strong enough. Hands and wrists are also used frequently, leading to a great deal of flexing of the wrist and irritating of the healing piercing. Because of these factors, wrist surface piercings can reject jewelry in as little as one week after piercing. To help keep the piercing in place for as long as possible, wear short sleeved shorts and rest the wrist frequently during the initial healing stages. Surface piercings have a high rate of rejection unless the piercing is cared for extremely carefully until it has finally healed. Because the barbell sits so close to the skin's surface, not only does irritation cause your body to try to push it out, the skin's natural regenerative process may end up moving the piercing out of its initial placement within several months to a year. Many people who have gotten wrist piercings complain of two divot shaped scars in the wrist, and pain in the wrist during and after the rejection process. Unless you are prepared to care for the piercing properly, be aware that the chance of rejection and scarring is high. To make sure your new piercing remains in place for as long as possible, take proper aftercare procedures. Getting a wrist piercing takes a lot more commitment and care to help ensure a lasting piercing than many other body modifications. Think carefully before getting pierced to avoid rejection before you've even gotten used to your new body jewelry.